Here you will find inspiring recaps of past Events and Projects.
" I expect to pass through life but once. If therefore, there be any kindness I can show, or any good thing I can do to any fellow human being, let me do it now, and not defer of neglect it, as I shall not pass this way again" William Penn. 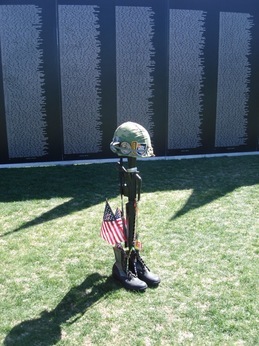 This quote seemed so meaningful this past week, at the Vietnam Veterans event in Sedona. Having the opportunity to have the replica of The Wall here in our own city, and giving thousands of people the chance to participate in the remembrance and reverence it inspired was so inspiring to all of us in SedonaKind. We were all so honored to do what we could to help make the event special for all the Veterans and their families. Several of our husbands helped with the Wall set up and take down, and many "lifting" and "hoisting" jobs that came up. We partnered with The Sedona Women to serve the opening day Brunch and to provide computer assistance for people coming to find out where their loved ones names were on the Wall. We were so happy to provide all the treats and afternoon snacks for all the Veterans, volunteers, ( and lots of visitors) for all 4 days of the event. Really, it was such fun to be able to bring the brownies and snickerdoodles that were requested by so many of the Vets. We also set up a tent and provided massages and Reiki for the veterans, and a huge thank you to those therapists who provided their services for free with loving hearts and hands. The whole 4 days were something none of us will ever forget. So many special moments stand out: hearing Colonel Kirk, a 5 and 1/2 year POW speak at both the opening ceremony and the luncheon at the Elks club, the Honor ride and salute, the beautiful song written and performed by Shawn Perry especially for the Veterans, the magical lighting of the luminarias against the background of the red rocks at dusk, the haunting taps and bagpipes, the beautiful singing of our National Anthem by so many of our local vocalists, and most of all, the appreciation and camaraderie of all the Veterans.